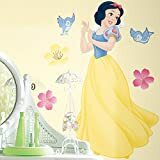 If your little angel’s favorite Disney Princess is Snow White then why not give her her very own Snow White inspired Bedroom? Trust me she will love it! The tale of Snow White and the Seven Dwarfs have enchanted us for years and if your daughter is anything like mine she’ll want you to read it over and over again. I have collected together lots of things for you to create an absolutely stunning Snow White inspired Bedroom and I am totally convinced that this will cause your daughter to want to stay in her bed instead of constantly getting up!! Now for me I always think that you can’t go past a nice white bed for a Disney Princess bedroom, because it can grow into whatever your daughter’s next passion is for. With that in mind I have selected a couple of options here for you. You can choose whether you prefer a metal bed or a wooden bed along with the design. 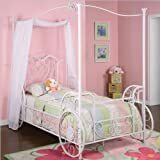 Obviously a young girl will love a bed that's like a princess' carriage and a canopy bed always seems like it's extra-extra special. 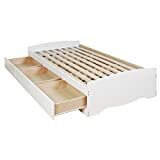 However the wooden storage bed will grow more with your child and you can still make it seem like a bed made for a princess with the addition of Snow White bedding. As a more practical thinking mother I always go for the bed that will last through whatever phases my daughter will grow through as she moves from toddlerdom all the way up to teenage years. If I had just won the lotto however I might just have picked the metal princess carriage bed for her when she was younger! If you have a little girl who loves the Disney Princesses then you may want to give her her very own little princess bed. There are a selection of different Disney Princess beds on the market, in particular toddler beds. Now that you have your little girl’s bed sorted you’ll need to dress it, but there's not a lot of Snow White specific bed clothes available. Snow White features on a number of Disney Princess bedding sets alongside fellow Princesses Cinderella, Belle and Aurora, but on her own there's not much available. Of course a bed without something to cuddle is a crime so indulge your little princess with a plush Snow White doll (like the one opposite) or even Snow White and all of the Seven Dwarfs! 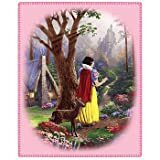 The other ways to decorate a Snow White bedroom is to look at the walls, now personally I would just use a plain color on the wall and adorn it with posters and wall stickers which are all easy to remove should your little princess decide she’s ‘so over’ Snow White! 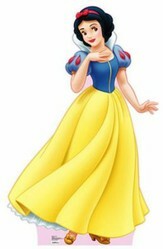 Most little girls dream of being a princess which is part of the attraction of the Disney Princesses. Here you will find some lovely Disney Princess posters which the little girl you love will absolutely adore.Do you have a favorite Disney Princess? While we’re still on the walls, you can also cover any switch plates quite easily and these look fantastic. Every little girl’s bedroom needs accessories and these can include snowglobes and photo frames and jewelry boxes or even Snow White dolls and figurines. Here are a few for you to use. If you have a big enough room then a couple of stand ups would add a fantastic touch whether you have the seven dwarfs or Snow White (see picture at the top of the page). Sometimes A Snow White Bedroom Just Won't Do!